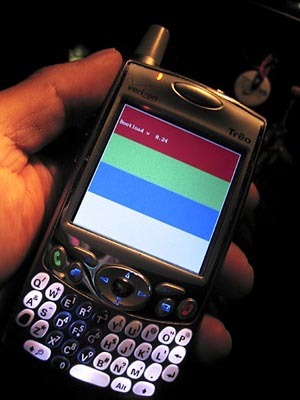 What you’re looking at is my Palm Treo 650 smartphone. At this moment it’s stuck at this bootload screen and the only way out of it is to remove the battery. This is after swimming in rainwater. Let me explain. I quickly picked all the pieces up, tried to wipe them down in the car and headed to the assignment. When I put it back together it was stuck in some kind of loop trying to Sync to my computer which wasn’t anywhere near to this smart (now dumb) phone. It would either go into the hotsync loop or I would get this boot screen trying to boot into the operating system. Well, I temporarily got it to work long enough to back up everything to the SD memory card in it. Now I’ve got it at home and hopefully it will dry out enough to work properly again. Some of the keys didn’t want to work earlier but it’s starting to work a little better. I’m going to leave it until morning. Quite the drag. *Update: Well, I let the phone dry out, partially by resting it on part of the laptop running which gets quite hot. The phone appears to work 100%, just as good as before the swim.